If the answer is always Miata then how do you explain today’s Nice Price or Crack Pipe Audi TT with it’s AWD, rev-happy VR6, and arrest-me red paint? Let’s see if this low-milage, retro Audi’s price is also a correct answer. You all had an answer to yesterday’s modded 1994 Mazda MX5 Miata and that answer was a 67% Crack Pipe vote. That was perhaps not what the seller was hoping to hear, but being Canadian and all, he’s probably taking it graciously, and may even apologize. The general consensus on that car was that the price reflected the work put into it, and as we all know the sum is never more than the parts, or in many people’s minds even the equal. One company that really makes the most of its parts bin is Volkswagen Aktiengesellschaft. VW AG owns and controls a broad catalog of brands and as much as they seek to establish each as unique, the company needs to shave costs by having them share as much as possible. That means that your six-figure Bentley could use the same key fob as a lowly Polo, while window switches in an Audi R8 might seem wholly familiar to an owner of a Skoda Yeti. It’s not quite as bad however, as your Grandpa plopping down into his then-new Cadillac Cimarron and sadly realizing it’s just a glorified Chevy Cavalier. Hopefully, it never will be. Today’s 2004 Audi TT 3.2 S-line is a good example of corporate cross-talk done right. Underneath the extrovert-red paint and retrotastic styling of this first-gen TT lies the A4 platform shared with the VW Mk IV Golf, Skoda Octavia, Audi A3, Seat Toledo, and a bunch of others. The thing of it is, if you were to put them all side by side, you’d probably not be able to see the shared bits unless you peered under their skirts. This model actually shares a lot of what’s under its skirt with one particular cousin, that being the Volkswagen Golf-based R32. Both cars share a full-time Haldex AWD system, which on the VW went by 4Motion and here gets badged as Quattro. They both also share VW’s scrunched up six, the narrow-angle unit which is the pearl under the TT’s clamshell hood. This being an S-line model that’s a 3.2-litre six, and that pumps out 247-bhp and does the twist to the tune of 236 lb-ft. That’s a bit more than VW slotted to the R32. Here it’s backed up by VW’s six-speed Direkt-Schalt-Getriebe (DSG) which is a fancy-pants collection of cogs that’s probably better than you at figuring what gear is needed at any given time. The DSG is a dual clutch multi-shaft manual transmission with a computer brain directing the action. In certain driving modes it will even blip the throttle on downshifts, and of course there’s flappy paddles in case you want a say in how things are done. The results are zero to sixty in about six and half seconds, about 15 mpg around town (the car’s a rather hefty for its size 3,350 pounds), and limpet-like handling from its upgraded suspension and secure AWD. Visually, you’ll know this is an S-line by the vented and more aggressive front fascia, rubber baby buggy bumper extended rear spoiler, and Xenon Warrior Princess headlights. The bodywork on this 87,000 mile example looks impressively clean, with only some speckling on the front valance to detract. You get brand new meats underneath, and fairly new (75% according to the ad) brakes behind those. There’s no claim of mechanical maladies on the car, and in fact the engine bay—resplendent in Audi-typical plastic shielding—looks clean enough to picnic on. The cloth top is equally tidy, while the only seeming evidence of its two-owner life inside is a slight sheen on the wheel and driver’s seat. Honestly, saying VAG and TT make this whole post feel awkwardly salacious, but then Audi’s 3.2 S-line two seater has always seemed a little sexier than most of the rest of the marque’s lineup, and it’s certainly a lot less utilitarian than its R32 platform mate. When new—which amazingly was fully 12 years ago—this car would have commanded upwards of $45K to own. Now it comes with an asking price of $11,980. That’s a loss of about $2,750 a year, which seems a fair trade for so likely fun a car. Of course, a slightly older Porsche Boxster could be had for similar cash. 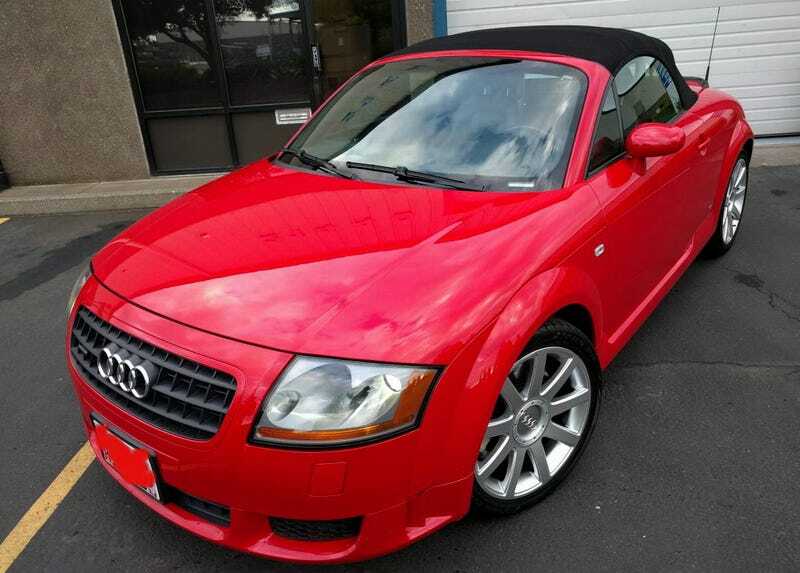 What’s your take on this Audi TT S-line and that $11,980 price? Does that seem like a fair deal to get into one of VAG’s best collections of parts? Or, is that just too much for this TT?